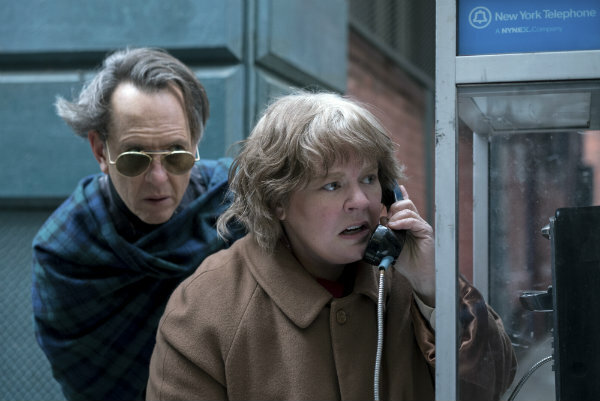 The early 1990s New York of Marielle Heller's "Can You Ever Forgive Me?" isn't so long ago but it already feels staggeringly distant. It's a New York of publishing industry cocktail parties, of book stores, lots of them, and of scheming, foul-mouthed eccentrics. "Can You Ever Forgive Me?" has justly won praise as one of McCarthy's best and most dramatic performances. As Israel, she's a gloriously embittered, hard-drinking curmudgeon incapable of holding her tongue — a distinctly New York creature if ever there was one. And her fear of slipping away is painfully real. "Can You Ever Forgive Me?" sings best — or rather, grumbles spectacularly — when McCarthy and Grant are together. They are kindred misfits and malcontents happy for each other's company. It's been more than three decades since "Withnail and I," and Grant remains the best drinking buddy in movies. As the even-more-down-on-his-luck Hock, Grant is a paragon of debauched decadence, tragic and magnificent at once. His regal bearing crackles with a sly wickedness. "Do not underestimate sparking blues eyes and a little bit of street smarts," he tells Israel in mid-hustle. That Heller, whose debut was the coming-of-age drama "The Diary of a Teenage Girl," has affection for these two is obvious. And just as in her San Francisco 1976-set debut, she leaves the moralizing to the viewer. That film brilliantly captured and let soar the voice of 15-year-old aspiring cartoonist. "Can You Ever Forgive Me?" is about a more frustrated female artist who finds self-expression illegally but genuinely. "I still consider the letters," Israel wrote in her memoir, "to be my best work." "Can You Ever Forgive Me?" a Fox Searchlight release, is rated R by the Motion Picture Association of America for language including some sexual references and brief drug use. Running time: 107 minutes. Three and a half stars out of four.